IBASSIN: 2018 FLW TOUR Lake Lanier Day 1: Bradley Hallman Commands with 23-11lbs! 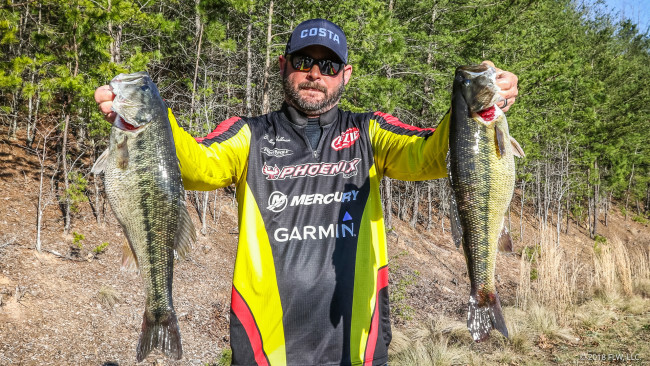 2018 FLW TOUR Lake Lanier Day 1: Bradley Hallman Commands with 23-11lbs! Every angler has “one of those days” when he can do no wrong. Today was Bradley Hallman’s. 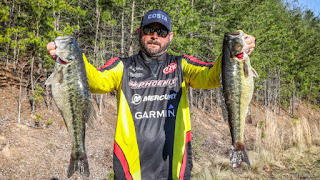 Big spots on the bite on Lanier but Hallman bested them all. Yes, the Norman, Okla., pro had a pattern, but he’ll also admit he got a little lucky. Regardless, the end result was a 23-pound, 11-ounce bag of fish to lead the FLW Tour presented by Ranger on Lake Lanier. But they weren’t just any fish. He weighed in 23-11 of spotted bass. “Today … it was such a day,” Hallman says of his dream day of spotted-bass fishing. Case in point: Hallman knew he 20+ pounds by 1 p.m. So, he went to a spot he figured would help his co-angler finish up his limit. Being that Hallman is a known power fisherman, one might’ve expected a bag like this to come up the stained rivers and be comprised of largemouths. Yet, Hallman power-fished in his own way, hitting roughly 45 different places on the lower end, everywhere from Brown’s Bridge to the dam. Obviously, he was a little tight-lipped about what he was specifically doing and the targets he was hitting, but he did say he was on “a herring deal,” in reference to the blueback herring in the lake. The same herring that have made Lanier’s spotted bass so fat and Lanier, itself, one of the best spotted-bass fisheries in the country. Of course, herring bites are notoriously finicky, something Hallman is certainly aware of. “Look, I’m not going to pretend I’m some expert on herring,” says Hallman. I feel I understand it a little from fishing some other lakes, but never like what I’m doing here.